Earlier this year, I visited a local patchwork shop, just to buy some cottons. At a glance, the decision was made, and before I realised, I was, sort of, a proud owner of this bright and colourful fabric panel with six different fun designs of flowers and a few leaves printed on it. But, I didn't actually know what I wanted to do with the fabric panel.!! After I got home, I put it on the floor. I looked at it, walked around it, and was wondering how I was going to be able to sew all the perfect 6 circles. One morning, I got out the biggest ceramic bowl we have got in the kitchen. At a moment's thought, I used it to draw a hexagon shape template for cutting out the six flowers. 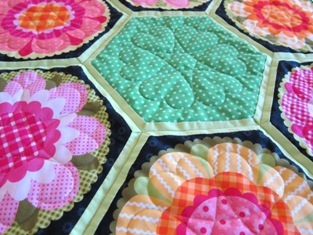 Then, it took quite a while to work out how I would go about sewing these big hexagons and finishing them off. 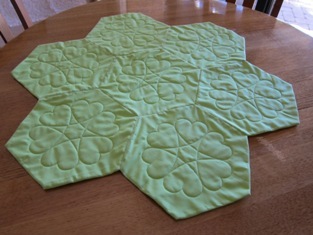 I ended up using my wonderful Gammill Statler Stitcher to quilt the hexagons and did the rest of the sewing by hand. 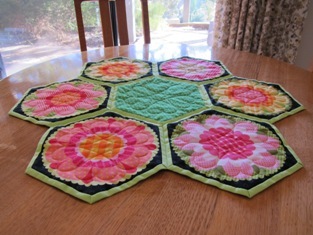 By adding one more hexagon in the middle, I was able to sew all the seven hexagons together to form a round table runner. It looks lovely on the round table and has brightened up our guest room at home.